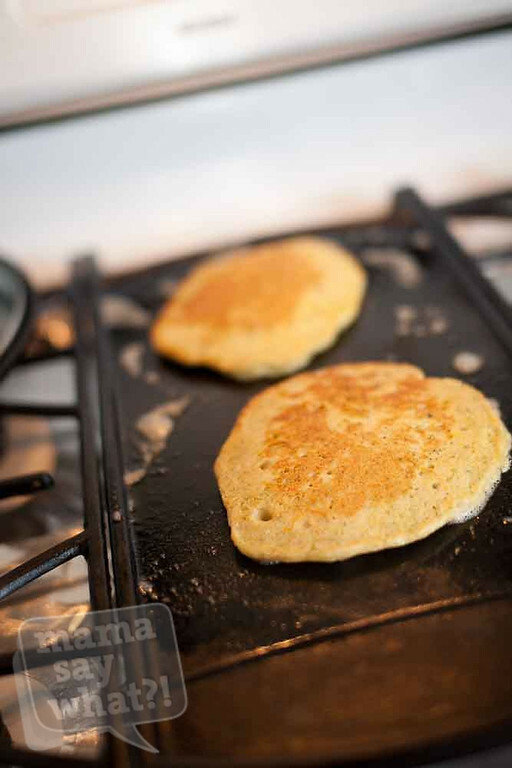 Carrot & Zucchini Pancakes Mama Say What?! | Mama Say What?! 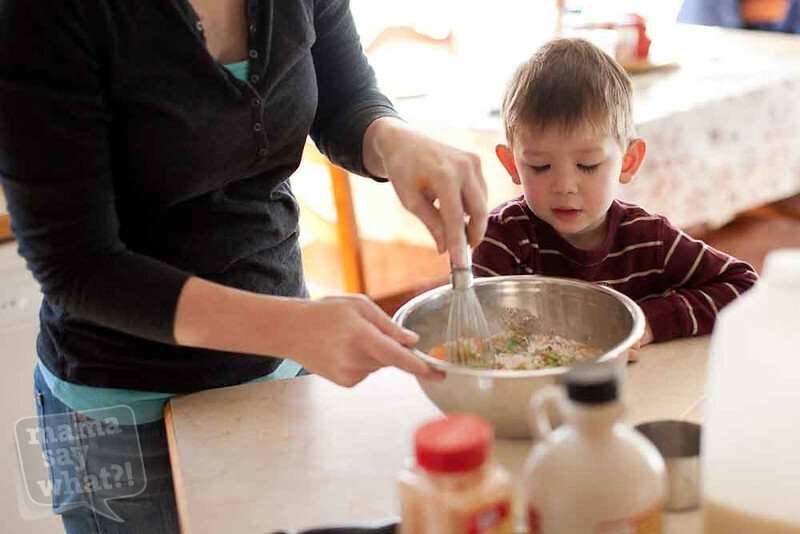 While Cari H., our boys and I were visiting a fellow mama and her two boys a couple of weeks ago, she made us carrot and zucchini pancakes for breakfast one morning. She said her oldest son devours them (he’s the same age as N and a few months younger than TJ). Admittedly we were skeptical, imagining our veggie-averting boys picking out any pieces that were green or orange. We were greeted by an amazing aroma when we got downstairs and all three of our boys happily scarfed down their pancakes. Once us mamas got to sit down and eat, Cari and I were both wowed by the wonderful flavors of cinnamon, vanilla and a hint of nutmeg. 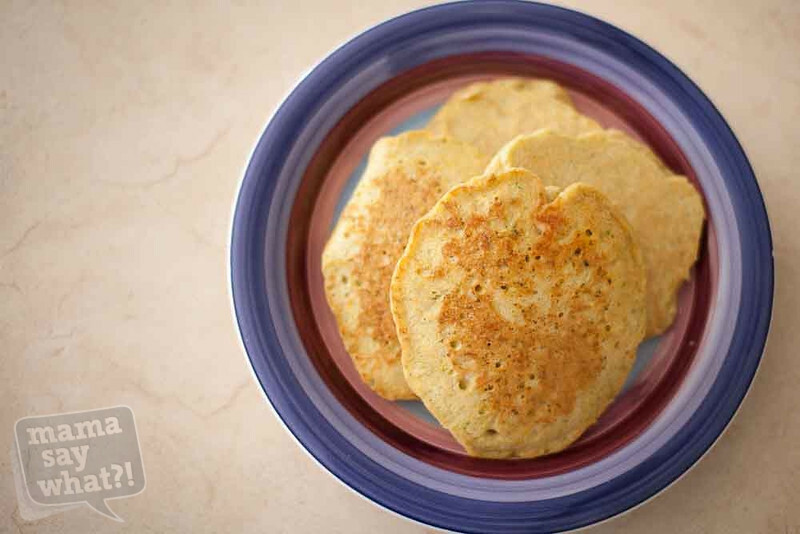 They tasted a little bit like zucchini bread, but in pancake form. 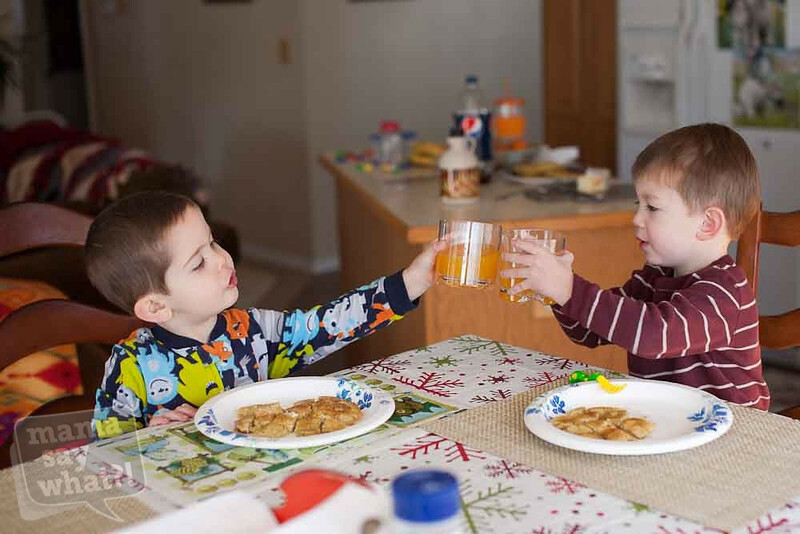 We topped the boys’ pancakes with honey, but I preferred topping mine with real maple syrup. There are a lot of recipes floating around for sweet pancakes with hidden veggies, but I love that our friend’s recipe (she says her husband was the one who came up with it) just used their Krusteaz pancake mix. 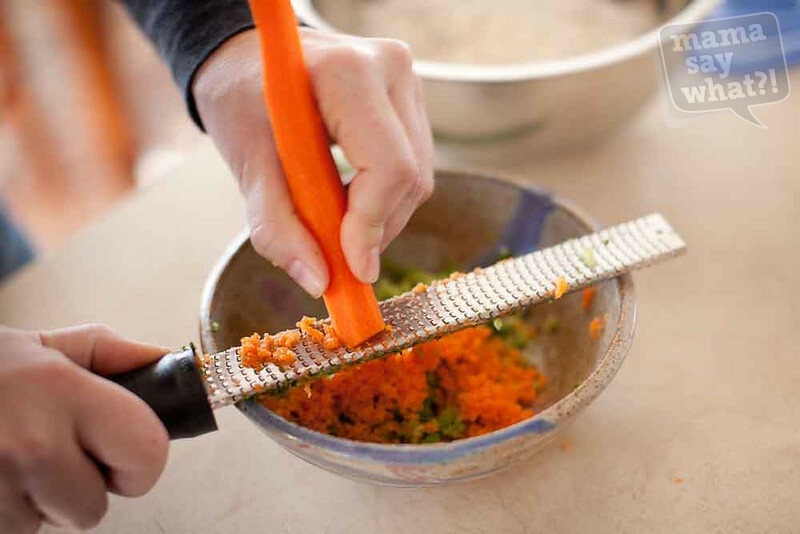 Using the finest side of your box grater or a microplane, grate the carrot and zucchini into a microwave-safe bowl. 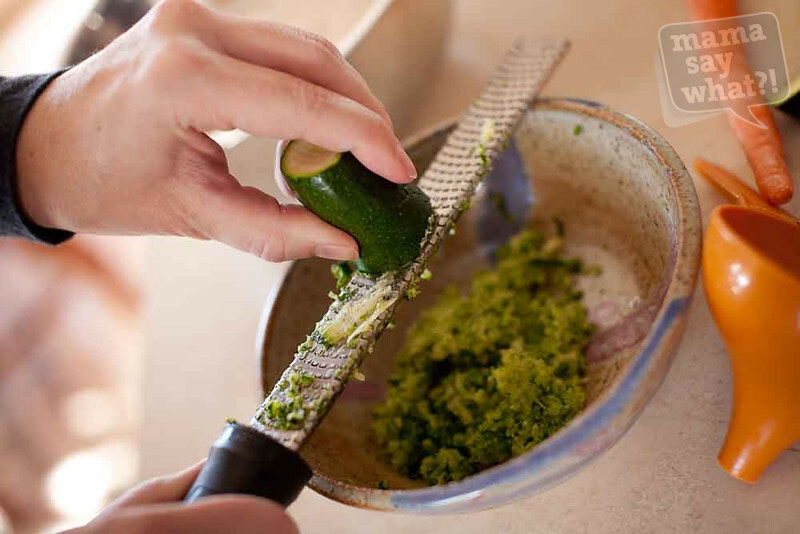 I really love to use my microplane for this because it creates a very fine grate but doesn’t make them mushy like a purée would. I know that if the veggie pieces were larger (like with my big-holed-box-grater) my son would likely try to pick out the pieces. Pop the bowl of grated veggies into the microwave and cook for about one and a half to two minutes on high. This will help to soften them. 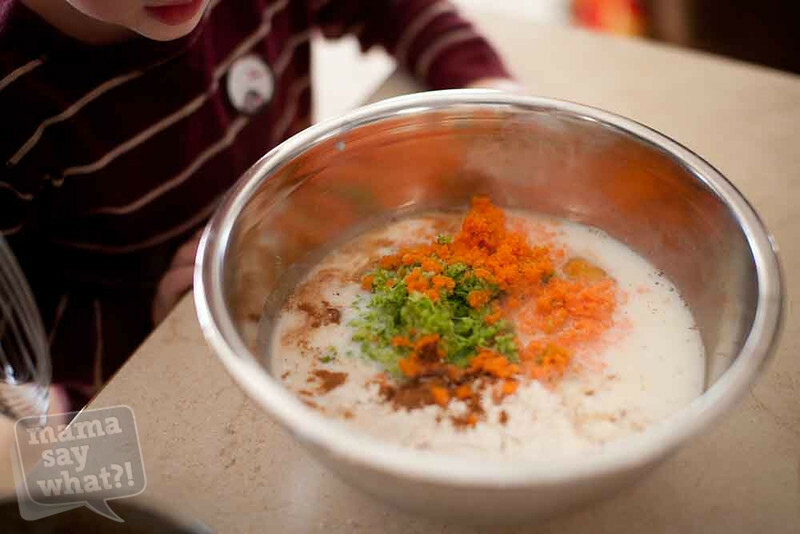 In a large bowl, combine the Bisquick, eggs, milk, carrots, zucchini, vanilla, cinnamon and nutmeg. Mix until thoroughly combined. Heat a non-stick frying pan or griddle to medium-low heat. Add a little bit of butter and swirl it around. You don’t want your pan so hot that the butter burns. 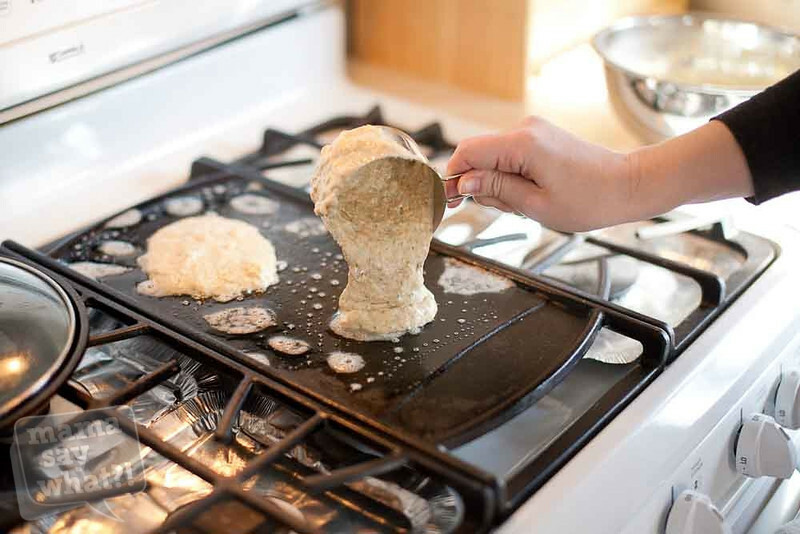 Cook your pancakes over medium-low heat just like you would any other kind of pancakes, flipping after most of the air bubbles have popped. This recipe will make approximately 10-12 pancakes depending on how big you make your pancakes. It can easily be doubled if you’re making pancakes for a crowd too. You can top your pancakes with butter, honey, maple syrup, powdered sugar, jams, jellies, fresh fruit or anything you love on top of pancakes. Our favorite topping is a little bit of butter and 100% maple syrup. Just like regular pancakes, you can store these cooled pancakes in a zip-top freezer bag and keep them in the freezer for eating another day. Just microwave a couple at a time until heated through. When I first made these at home, I tried my best to hide the fact that I was putting carrots and zucchini in the batter. But now, TJ doesn’t mind and often wants to help grate the veggies and mix the batter. 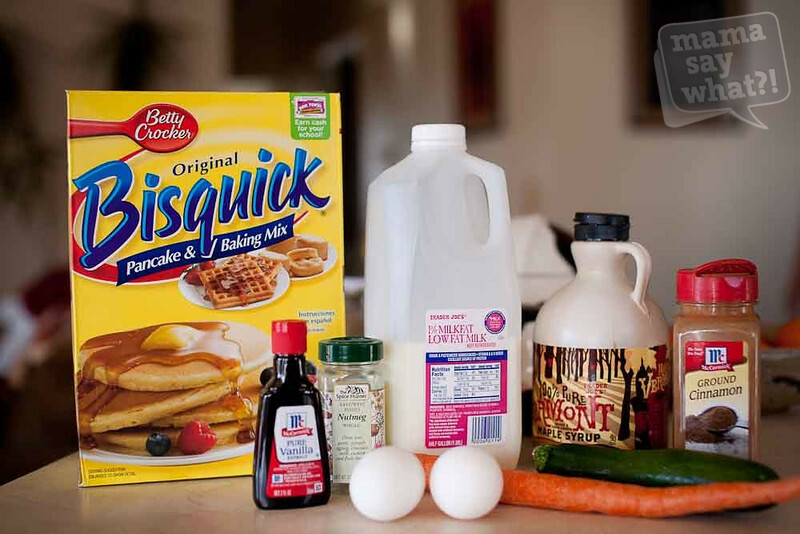 If the usual pancake mix in your house isn’t Bisquick or is a just-add-water variety, you can still use this recipe. Just omit the milk and see how the consistency of the batter is. If you think it needs some liquid, add a little milk until the batter looks right to you. Adding the milk and eggs adds a good amount of protein, which we all love. They are definitely a hit in our house and in Cari and N’s house too! 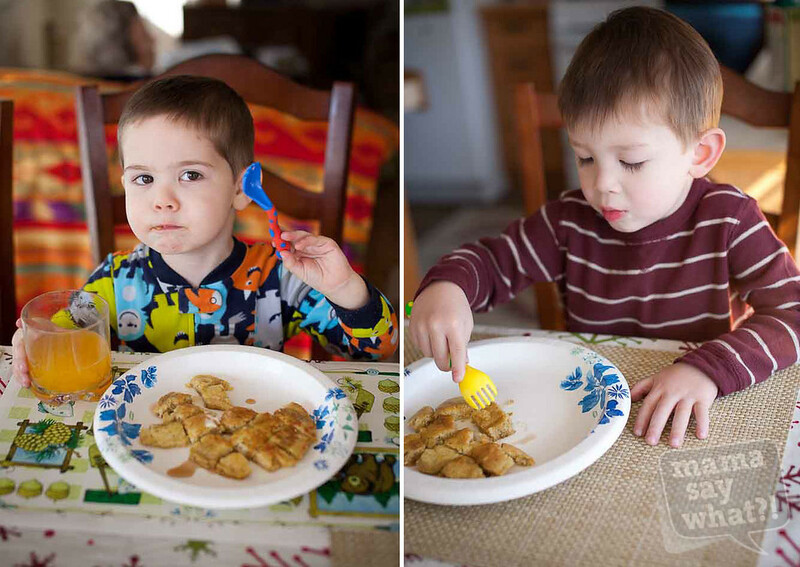 Added by Alex T. on February 21, 2013.
seriously the yummiest pancakes. ever. How cute is the final pic? I’ve made them and agree – they’re great! I forgot to add the vanilla and spices and they were still yummy! They are soooo good. Yum! Pingback: Spinach Muffins Recipe Mama Say What?! | Mama Say What?! My son officially prefers these pancakes over plain ones. He even loves to eat them topped with peanut butter and bananas now. Win! Pingback: Ask the Mamas: Toddlers & Veggies Mama Say What?! | Mama Say What?! These pancakes are delicious! My kids don’t eat zucchini or carrots, and I thought it would be too many veggies when I was mixing it, but we all loved them! Thank you!